Parking is very limited at the Event Centre so parking for cars will be at Ashcombe School. We are using the entrance off Croft Avenue, which is directly across the A24 from the entrance to Dorking Station. There is a crossing point through the central reservation but no traffic lights. Use postcode RH4 1LN for SatNav. Competitors will then be bussed to High Ashurst. Estimated total time from car park to the start call-up allowing for waiting for the bus and walking to the start is about 50 minutes. There will be a £1 charge per vehicle for parking at Ashcombe School. Drivers of MPVs and larger vehicles that have been authorized to park at the Event Centre will receive separate instructions on how to approach High Ashurst. If you have not received a car park pass for High Ashurst please do not attempt to drive there – you will be turned back at the entrance. There are main line train services from London Victoria and Waterloo to Dorking Main, which is about 10 minutes walk from Ashcombe School. There is also a 2 hourly cross-country train service to Dorking Deepdene, which is also about 10 minutes walk from Ashcombe School. Coaches to the Event Centre will run about every 10 minutes from the Car Park. The first coach will be at about 9:00am and the last coach back from High Ashurst will be at about 3:00pm. Please do not wear muddy shoes in the coaches. There is plenty of space for bags in the marquee at the Event Centre. The Event Centre is at High Ashurst – Surrey Outdoor Learning and Development Centre. Grid Reference: TQ186534. Within the grounds of the Event Centre there is a large marquee that contains Enquiries, EOD, SI hire, Download and Bag Drop. High Ashurst are serving hot drinks and hot food by the Grand Hall between 10:30 and 2:30. We regret that High Ashurst does NOT allow dogs. 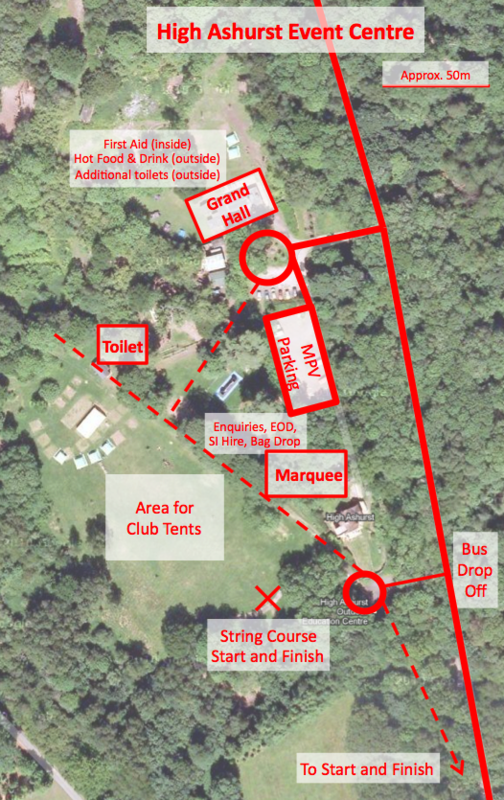 There will be a String Course in High Ashurst grounds, open between 10:00 and 12:30. The start/finish is about 100m from the Bus drop-off point and the event centre marquee (as shown on the Event Centre map). 1:10000, newly resurveyed by Mike Elliot to January 2013 and printed on waterproof A4 paper. Control descriptions are printed on the front of the map, in English for Yellow and White, and pictorial for the rest. The Brown course is in two parts, printed back to back. The area is a mosaic of open heathland, with a cover of heather, gorse or bracken, chalk downland, and mixed woodland of varying runnability. There is ongoing conservation work in a couple of areas. Topographically, the Heath consists of a plateau, two deep wooded valleys, with some more gentle open slopes. There are areas of complex ground detail. A stock fence almost totally encloses the Heath. If you cross this fence (only the Brown and Blue courses are likely to), it is recommended to use one of the many gates, but use of the gates is not obligatory. Please report any damage to the finish. A small herd of Belted Galloway cattle have free range of the area within the stock fence. They are extremely placid, but also unlikely to move away at your approach. Please keep your distance, and please ensure younger competitors are aware of their presence. The Heath is heavily used by walkers and horse riders. Please respect their right to enjoy the Heath. The start is 550m from the event centre marquee, crossing a 45m deep valley with steep sides that can be slippery. Allow 10 to 20 minutes depending on state of agility. The route is not suitable for pushchairs. Call up at –4 minutes. Loose control descriptions will be available in the start lanes. Both pictoral and english descriptions will be available for the Orange course. Please note that shadowing of Juniors on CSC courses is not permitted. The finish is a level 300 metres from the event centre marquee. Download is in the event centre marquee. You must report to download by the course closure time of 14:30 even if you have not completed your course. Start times are posted on Fabian 4. Please check your times. We recognize that there may be delays caused by the bussing up from the car park, so competitors who arrive late at the start will be given the next available start time subject to the required start time separations being maintained. There will be limited entry on the day (EOD) for courses 1 to 7, subject to map availability. There is good availability of maps on the Orange, Yellow and White courses. You are advised to arrive early if you want to enter on the day. SportIdent (SI) punching will be used. Dibbers may be hired at £1 for Seniors and free for Juniors. The Red Cross is providing First Aid cover. They will be located in the Grand Hall (see the Event Centre map). Snacks, hot food and hot and cold drinks will be available to purchase beside the Grand Hall. These refreshments are provided by High Ashurst kitchen staff. Competitors take part in this race at their own risk. Entries and results will be processed by computer – your entry will be taken as agreement to this. The competition is run under the CompassSport Cup Competition Rules version 1.3. Check the SLOW website prior to travelling for any updates, particularly if the weather is bad.